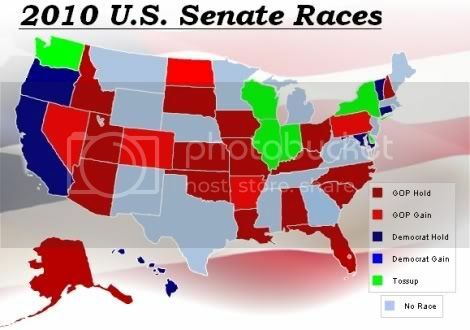 Here is our current "2010 U.S. Senate Projection Map" based on current polling data. You can go here to see all the poll data in the 2010 U.S. Senate Poll Table. Six other States are "Tossups"
Republicans need to gain ten seats to retake the U.S. Senate. Check back daily for the latest map and polling data.